We house almost two thousand historical, important Judaic titles. Please visit, and sit, read, reflect. 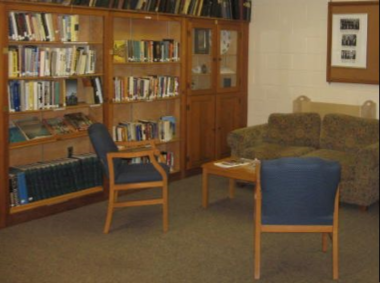 The Temple Bnai Israel Library provides materials for the congregational members, staff, and community. The library collection consists of materials in multiple formats that will enable members to enhance their experience of Jewish life and provide the resources for the study of Judaism. If you would like to borrow an item, please sign your name to the book card and drop it in basket on the library desk. The collection may be searched at Library Thing. Visit the site often, we are adding new titles monthly. If you would like to recommend a title, please contact us at office@templebnaiisrael.org or call 860-423-3743, and please consider making a book donation to the Temple Library. Winston Churchill: Walking With Destiny: Churchill’s years, his early opposition to Adolf Hitler and Nazism, and his support for Jews under threat by the Nazi regime. Genocide: The story of man’s inhumanity to man. Echoes That Remain: A poignant study of Jewish shtetl life before the Holocaust. Liberation: Addresses two themes in a single film: The dramatic story of the battled waged on two fronts during the War: the Allied campaign to liberate Europe and Adolf Hitler’s genocidal war against the Jews. The Long Way Home: Examines the critical post-World War II period between 1945 and 1948 and the struggle of tens of thousands of displaced Jewish refugees to find dignity and renewal. This was a winner of the 1997 Academy Award for best feature documentary. In Search of Peace: 1948-1967: Chronicles Israel’s first two decades, offering new insights on the origins of the Middle East conflict. Unlikely Heroes: Documents unknown stories of resistance during WWII. Ever Again: Examines the resurgence of violent anti-Semitism and terrorism in Western civilization. Beautiful Music: The remarkable story of Devorah Schramm, an American-born, Orthodox Jewish pianist and composer who, after relocating to Israel, taught piano to a 9-year-old blind and severely autistic Palestinian girl…in the worst days of the Intifada. I Have Never Forgotten You: The Life and Legacy of Simon Wiesenthal: The story of a many who lost 89 family members, helped track down 1,100 Nazi War criminals, and spent six decades fighting anti-semitism and prejudice against his people. You may check out one, or all, of these DVDs just as you would one of our Library’s books. Please contact us at office@templebnaiisrael.org for our hours of operation.